Otago is the only New Zealand university to offer Dentistry and Surveying. One of only two medical schools in New Zealand. Unmatched record in the National Teaching Excellence Awards: Five Supreme Award winners in successive years and seven over the last 14 years. Tops three of the four key measures of students’ educational performance at New Zealand’s universities, based on the Tertiary Education Commission’s Educational Performance Indicators for 2015. Otago performs most strongly in the QS World University Rankings, placing 169th in the world. Otago holds the highest placing for an individual subject in these rankings of any NZ university, with its School of Dentistry ranked 12th in the world in the most recent QS subject rankings. Psychology at Otago ranked 38th in the same exercise, and in total the University achieved 13 subjects in the global top 100, and a further 11 subjects between 101st and 200th in the world. Founded in 1869, Otago is New Zealand’s first university. It enjoys a worldwide reputation for excellence, successfully balancing the traditions of its history with modern scholarship and research. 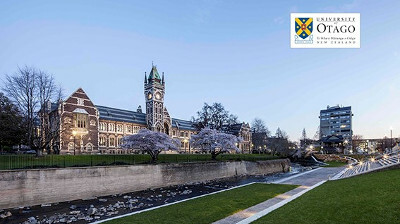 Otago places well inside the top 300 of the more than 10,000 universities worldwide in all the major international rankings, and is the second placed New Zealand university overall in all of these rankings. It offers a unique campus lifestyle, creating a culture of learning that reflects the special characteristics of New Zealand together with international academic values. Student surveys show overwhelming satisfaction with services provided. (99% with campus safety; 98% with sport and recreation facilities; 96% with libraries; 96% with administration and support; 96% with residential colleges). 96% of students provided a positive assessment of the general campus environment.